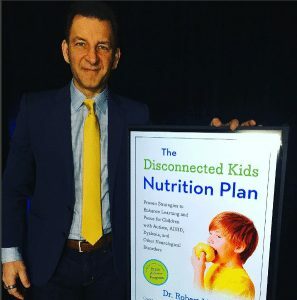 Dr. Robert Melillo’s newest book, The Disconnected Kids Nutrition Plan” was released this week! As part of the new release, Dr. Melillo will be on a whirlwind book tour to talk about nutrition and how it influences childhood development as presented in his book. We will post his appearances as they become available – stay tuned! The book is now available for purchase on Amazon.com. With a forward by entertainer Zac Brown, all proceeds for the sale of this book will benefit Camp Southernground. Dr. Robert Melillo’s Brain Balance Program has helped thousands of families across the country, offering a drug-free, scientifically based method for addressing a wide range of conditions, including autism spectrum disorders and ADHD. In this new book, he presents the nutritional side of the Brain Balance Program, featuring guidelines, tips, and kid-friendly recipes based on the latest scientific research on how food affects the brain. Recognize the difference between a fussy eater and a problem eater. Ease the sensory issues that make for mealtime mayhem. Identify food sensitivities using a simple elimination diet. Choose supplements that will help ensure adequate daily amounts of the specific vitamins and minerals important to brain health. Prepare delicious, healthy meals that will pass the taste test of even the most finicky eaters. Understand how the brain plays a primary role in many dietary and nutritional issue including food sensitivities. Disconnected Kids presents an optimistic and practical approach to opening windows of exploration, connection, and learning to all children. A highly recommended exploration for parents, educators, and therapists.